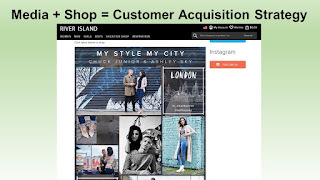 River Island partners with a production company to create mini-movies that feature River Island merchandise being worn by the bloggers who "act" in the movie. When you look at this production company, you frequently observe videos that have been watched more than a million times. I know, I know. Nobody wants to watch a movie about widgets. You think this stuff only works for fashion brands. You tried creating a video with a flip phone in 2006 and only 98 people watched it. This video appeared on the River Island blog, and on YouTube. And unlike your email campaign that has a life of eight hours, if done well, a video sits out there doing hard work for months or longer. Ok, you're never going to follow this advice. Fine. 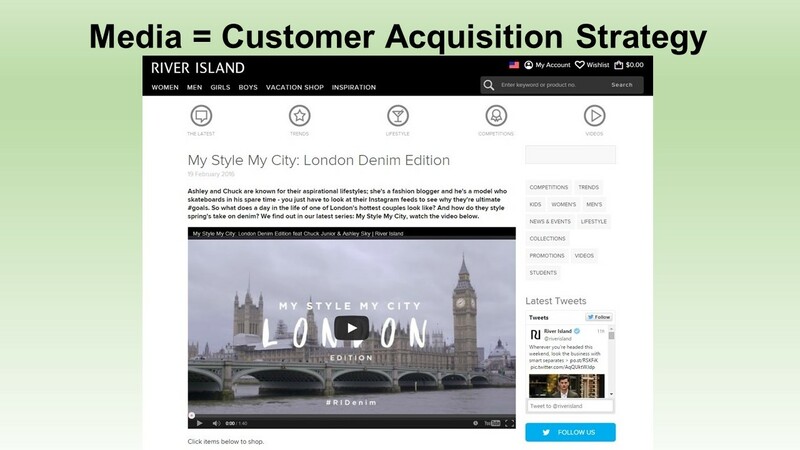 Tomorrow, I will show you how a competing brand leveraged the work done by River Island. How often do you buy a mattress? So let's assume that your Sleep Number and Tempurpedic brands are equally comfortable and similarly priced. You run across Eve Mattress. Not as well known, right? How do you compete? In this example Eve Mattress uses Facebook to promote an eBook about the "Grouchy Grouch". What are the odds of delivering a return on investment doing this? Minimal. Do you have to do something different to attract a customer if you are not Sleep Number and/or Tempurpedic? Absolutely! The Brand Response Marketer is not afraid to try low-cost techniques, and is not afraid of failure. Maybe you spend $40,000 working with an illustrator. You might need to sell 25 or 30 mattresses to earn enough margin dollars to cover the cost of an illustrator. Seems like it is worth trying, don't you think? Afraid of spending $40,000 with an illustrator? How about one of your creative employees? There's no incremental cost whatsoever ... and if you sell 5 mattresses because of your strategy, you generated profit, right? The Brand Response Marketer is not afraid of trying things. The Brand Response Marketer is not afraid of failure. The Brand Response Marketer tries 20 different tactics, knowing that 3 will generate enough success to cover for the 17 that fail. 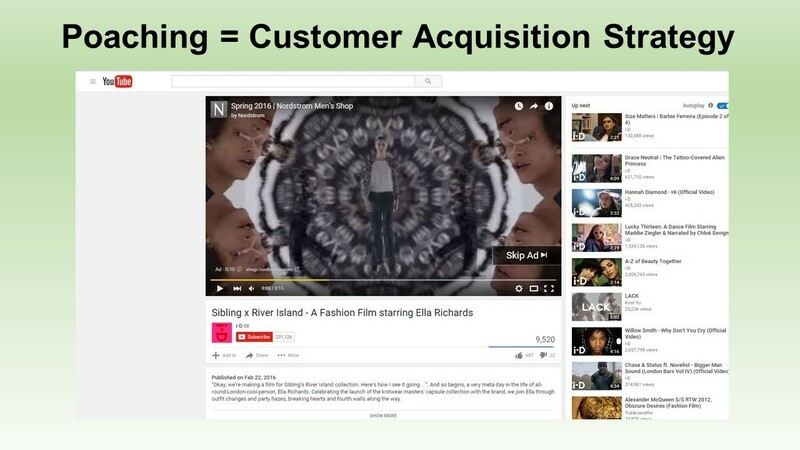 Here's a newer slide from my customer acquisition presentation (click here). 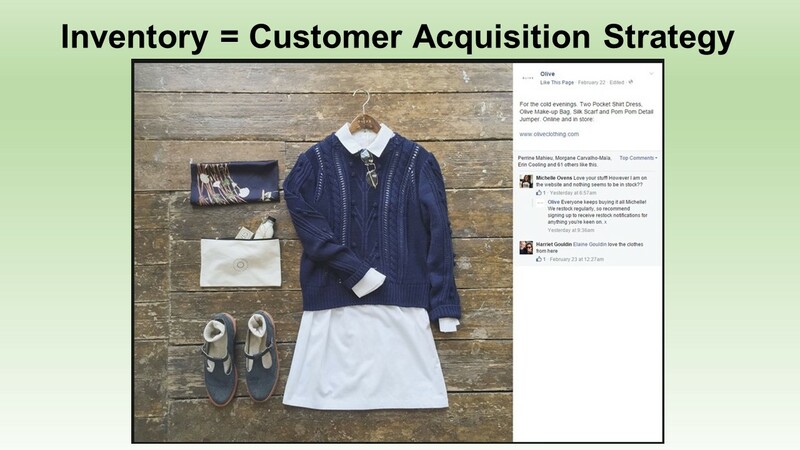 Here, in this image from Olive via their Facebook presence, a customer complains that items are always sold out quickly. 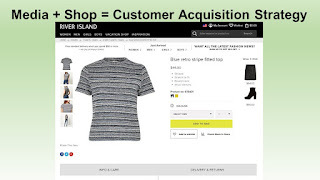 The employee responds ... suggesting that the customer visit often, because the merchandise assortment is frequently refreshed. There is a difference in how classic brands view inventory management, and how newer digital/retail brands view inventory management. The classic brand doesn't want to disappoint a single customer. As a result, the classic brand doesn't create urgency through inventory ... maybe via 20% off or 30% off, but not through inventory. The modern digital/retail brand creates urgency via marginal inventory positions. When the brand has a reputation for running lean, purchases tend to happen NOW. Customers/Prospects visit more often. Inventory turns are faster. Liquidations are minimized. Profit is generated. The downside, of course, is that the lean digital/retail brand misses out on purchases, simply because not enough inventory is maintained. Urgency via Inventory Position is a strategy to convert prospects fast. You may or may not agree with the strategy. But at least think about it, ok? Watch what happens when a customer purchases 2 items at $90 each, instead of 4 items at $45 each. This is a common outcome. Your merchandising team raises prices, the customer trades off by purchasing fewer of the expensive items, and the net result is a less profitable customer. See what happens when the customer purchased 3 items at $45 instead of 4 items at $45. It's helpful to have more items, isn't it? Now, let's try 4 items, and instead of having them at $45, we'll buy them at $60. So the secret is to somehow increase prices and increase units. Unfortunately, it is terribly hard to do both. At least be aware of the tradeoffs that occur between prices and units. As a former CMO once told me ... "units equal customers". Ok, here's the same data as illustrated yesterday, but for recently acquired buyers, illustrating their downstream repurchase rates. Cumm Rebuy Rate at End of 12/2014 = 2.4%. Cumm Rebuy Rate at End of 1/2015 = 3.9%. Cumm Rebuy Rate at End of 2/2015 = 4.9%. Cumm Rebuy Rate at End of 3/2015 = 6.1%. Cumm Rebuy Rate at End of 4/2015 = 6.9%. Cumm Rebuy Rate at End of 5/2015 = 7.9%. Cumm Rebuy Rate at End of 6/2015 = 8.9%. Cumm Rebuy Rate at End of 1 Year = 15.2%. Cumm Rebuy Rate at End of 10/2014 = 3.8%. Cumm Rebuy Rate at End of 11/2014 = 7.4%. Cumm Rebuy Rate at End of 12/2014 = 9.9%. Cumm Rebuy Rate at End of 1/2015 = 11.0%. Cumm Rebuy Rate at End of 2/2015 = 13.7%. Cumm Rebuy Rate at End of 3/2015 = 15.5%. Cumm Rebuy Rate at End of 4/2015 = 16.9%. Cumm Rebuy Rate at End of 1 Year = 21.8%. It's the same story for this company, simply condensed down to a year instead of a five year window. Do the analysis - it's gonna be enlightening, and it will cause you to question what you are doing. Or, send me a message and I'll analyze the issue for you (kevinh@minethatdata.com). Cumm Rebuy Rate at End of 12/2010 = 2.7%. Cumm Rebuy Rate at End of 1/2011 = 4.7%. Cumm Rebuy Rate at End of 2/2011 = 6.1%. Cumm Rebuy Rate at End of 3/2011 = 7.9%. Cumm Rebuy Rate at End of 4/2011 = 9.4%. Cumm Rebuy Rate at End of 5/2011 = 10.9%. Cumm Rebuy Rate at End of 6/2011 = 13.1%. Cumm Rebuy Rate at End of 1 Year = 21.7%. Cumm Rebuy Rate at End of 2 Years = 26.9%. Cumm Rebuy Rate at End of 3 Years = 29.8%. Cumm Rebuy Rate at End of 4 Years = 31.8%. Cumm Rebuy Rate at End of 5 Years = 32.9%. Cumm Rebuy Rate at End of 10/2010 = 4.1%. Cumm Rebuy Rate at End of 11/2010 = 9.5%. Cumm Rebuy Rate at End of 12/2010 = 13.3%. Cumm Rebuy Rate at End of 1/2011 = 15.1%. Cumm Rebuy Rate at End of 2/2011 = 16.5%. Cumm Rebuy Rate at End of 3/2011 = 18.7%. Cumm Rebuy Rate at End of 4/2011 = 20.6%. Cumm Rebuy Rate at End of 1 Year = 29.1%. Cumm Rebuy Rate at End of 2 Years = 34.4%. Cumm Rebuy Rate at End of 3 Years = 37.6%. Cumm Rebuy Rate at End of 4 Years = 39.8%. Cumm Rebuy Rate at End of 5 Years = 41.5%. Do you see what happens? In this case (your mileage will vary), the December buyer starts off with low repurchase rates (Jan/Feb are not big demand months), and the customer never catches up. 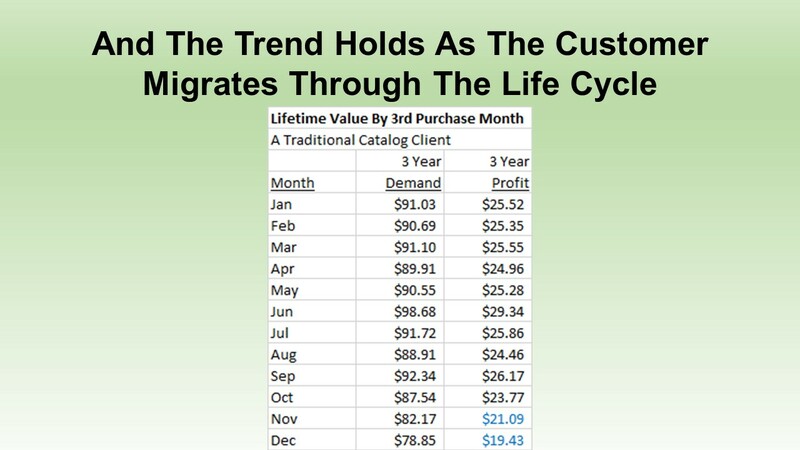 Look at what happens to customers acquired in October 2010 ... they are immediately responsive ... you get the same percentage to repurchase in two months that you get from December 2010 buyers in six months. Why? In large part, this happens because Nov/Dec are highly responsive months. Look at the October 2010 data, especially once you get to January ... cumm repurchase rates slow down dramatically, because Jan/Feb are not big demand months. 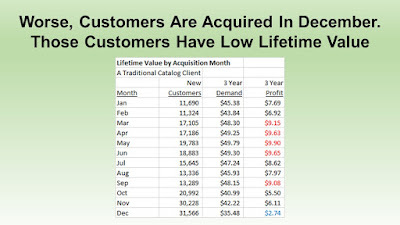 You obtain an advantage when you acquire customers just before big demand months. If I were a catalog co-op, Google, or Facebook, I'd be selling that message very hard - heck, it isn't hard to run a life table to measure the dynamic, is it? And if I were you, I would assign my analytics team this challenge ... they need to explain the dynamic to the whole company. 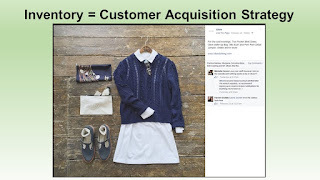 Maybe your peak season is in April ... then you need to acquire customers in February so that those customers can purchase for the second time in April, right? Have your analytics gurus analyze this issue thoroughly. 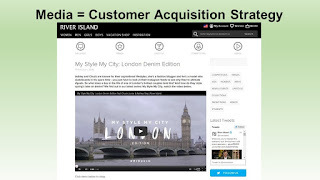 Pass the information along to your customer acquisition team. Pass the information to your Brand Response Marketing team. Then craft tactics that capitalize on this dynamic. P.S. Critics will say that this is old data, and I should focus on new buyers from 2014. Ok. Tomorrow, we'll do that. 1st Full Year Demand = $44.40. 2nd Full Year Demand = $19.66. 3rd Full Year Demand = $15.61. Three Year Demand Value = $79.67. Three Year Profit = $13.87. 1st Full Year Demand = $25.36. 2nd Full Year Demand = $10.62. 3rd Full Year Demand = $9.25. Three Year Demand Value = $45.23. Three Year Profit = $3.09. Your Brand Response Team takes advantage of this dynamic. 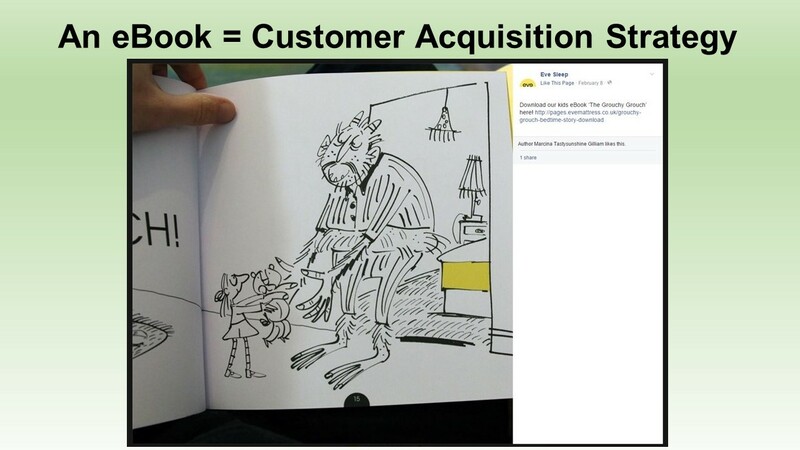 They plant all sorts of customer acquisition seeds during the year. They harvest new customers in September/October. Those new customers pay back, immediately, in November/December. Here's what you keep telling me. Source #1 = Catalog Co-Op. Profit per New Customer = ($11.00). You lost $11.00 profit to acquire the customer. Year 1 Profit Per New Customer = $17.00. Year 2 Profit Per New Customer = $12.00. Two Year Net Profit = ($11.00) + $17.00 + $12.00 = $18.00. Source #2 = Some Form Of Digital Marketing. Profit per New Customer = ($13.00). 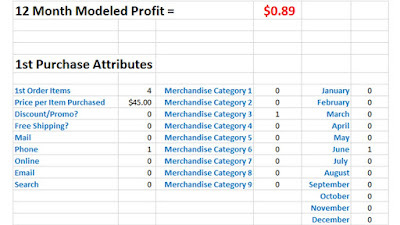 Year 1 Profit Per New Customer = $13.00. Year 2 Profit Per New Customer = $9.00. Two Year Net Profit = ($13.00) + $13.00 + $9.00 = $9.00. At this point, you tell me that the catalog co-op customer is worth twice as much as the customer acquired from digital marketing. At this point, you tell me that you don't care about acquiring customers via digital marketing, because they are "worth less". Two years from now, you'll call me to tell me that your co-op sourced names are all 65 years old and that they are driving your merchandising assortment into an array of merchandise preferred by retired customers ... and the merchandise assortment is no longer appealing to customers sourced from digital marketing ... and therefore, you cannot afford to leverage digital in a meaningful way. Oh, wait, this all actually happened between 2010 - 2015. Here's how thinking can evolve. 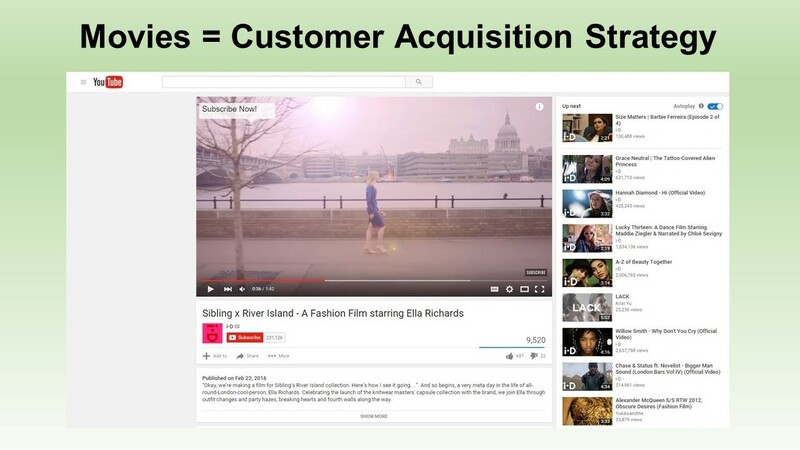 Be content with acquiring two customers that generate the same profit as one customer. 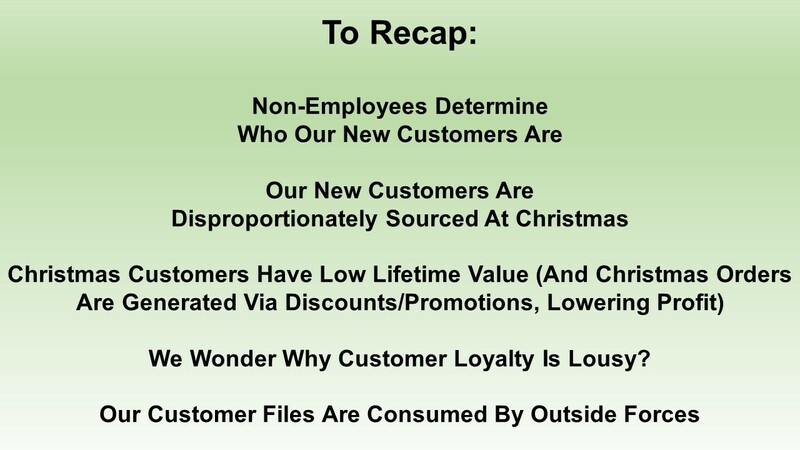 Treat these customers differently downstream. You'll end up with a bigger customer file, but one that is less productive. Regardless, profit is the same, right? And isn't profit what matters most? I know, I know, I just talked about how December buyers tend to have lower lifetime value. You'll tell me you just need to ramp-up your efforts in December. But for most catalog-centric brands, market share is being lost in December to online brands, to Amazon, and to retailers who really stepped-up their e-commerce efforts. We need to find other times of the year to find new customers. And if we cannot do that, and if our primary source of new names is shrinking, well, then we have to think long and hard about finding new customers from other sources, regardless of reduced lifetime value. Ok, you have your "war room" plastered with five years of customer acquisition history, right? You publish all of your customer acquisition metrics from all sources on the wall in your "war room", don't you? On the walls, you have key metrics you share with your company, by source of acquisition. Total Demand Generated by Year. Ad Dollars Spent by Year. Total New Customers, by Year. Marketing Cost per New Customer (Total Ad Dollars / Total New Customers). Profit per New Customer (Total Profit / Total New Customers). Year 1 Profit per New Customer. Year 2 Profit per New Customer. Year 3 Profit per New Customer. Year 4 Profit per New Customer. Year 5 Profit per New Customer. You are probably saying to yourself, "Hey, idiot, when we acquire a customer from a new source, we don't know anything about years one through five." True. But it is your job to estimate those figures. That's what you are being paid to do. So make a guess, based on what you see with other sources of acquisition. Compare profit per new customer at the point of acquisition with profit in year one. Do you lose twelve dollars of profit acquiring the customer, and then make twenty dollars of profit in year one? Yes? Then it might be a good idea to acquire that customer, right? Sit down with your CFO and share your data - heck, it's posted on the walls of your "war room", so just invite her in to take a look. Ask her how deep she is willing to invest in a new customer ... you might be surprised to learn that she is willing to lose money for up to three years in order to grow the business. Or, you might learn about the financial distress your company must deal with ... and that's the reason you can only prospect to break-even. The key, of course, is to use profit per new customer as the driving metric in this analysis. Don't use marketing cost per new customer, as that metric does not cleanly align with future profit (yes, if you do the math, there is 100% correlation between profit per new customer and marketing cost per new customer, but most people don't do the math to learn the relationship, you included, so just use profit per new customer). This one is interesting. Look at a customer acquired in June. Ok, now let's see what future value looks like for those who took advantage of free shipping. This company generates an average of $10.00 of shipping/handling revenue. In other words, free shipping caused the company to lose $10.00 ... and the customer paid back $6.15 of incremental profit in year one. If I ran the analysis forward another year, we'd probably see that all ten dollars have been recouped. But it took two years to recoup the profit. Two years! And in so many of my projects, the profit is NEVER recouped. Make sure you are measuring what you lose up-front with free shipping. Make sure you are measuring what you gain, downstream, from a customer acquired via free shipping. You should know that Lifetime Value projects are currently the second-most popular, after Merchandise Forensics projects. 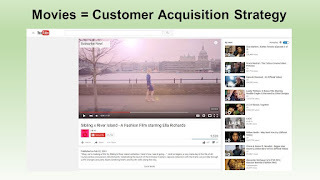 When you talk a lot about customer acquisition, people want to learn more about the customers they are acquiring. Most companies don't measure lifetime value. Which is interesting, of course, because your investment strategy is 100% dependent upon lifetime value calculations. 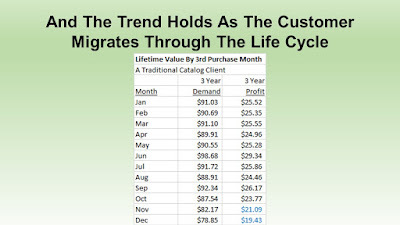 I tend to create two different analyses ... one being a twelve-month value analysis ... the other a five year customer migration simulation, designed to measure how lifetime value declines as the customer changes/ages. In any lifetime value analysis, we care about repurchase rates and customer spend ... but we care much more about profit. 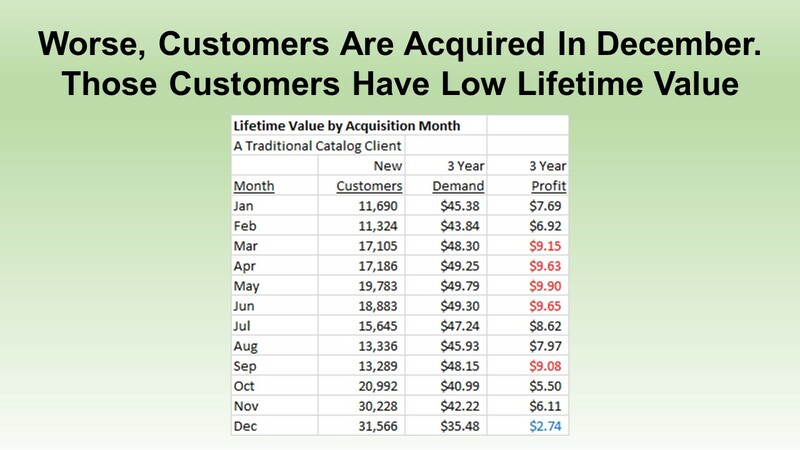 This is the other interesting thing about lifetime value work in the industry ... most lifetime value projects measure annual demand or downstream demand ... which makes it impossible to measure the trade-off between how much you invest acquiring a customer and how much the customer pays you back. In my twelve-month profit models, I evaluate many different attributes. Here is a sample, based on real data from a real company. Here, we observe a customer with a set of attributes. This customer generates $6.54 downstream profit. This would not be the kind of customer you want to lose $30.00 profit acquiring, do you? I've mentioned the "December Effect". The example above is for a customer acquired in June. Watch what happens when we acquire a customer in November. We've already lost three dollars of profit. Now look at what happens in December. Let me state this differently ... for this company, they have to acquire ten times as many customers in December as they have to in June to obtain the same amount of future profit. Is it any wonder it is so hard for companies to generate profit? I work with many companies that generate half or more of their new buyers in November/December, because that is when it is "easy" to acquire a customer. Think about this. Is it any wonder we work so hard to encourage "loyal" behavior? 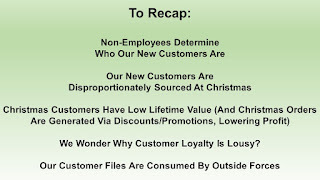 If we keep acquiring disloyal buyers in November/December, prospects who are looking to meet a Christmas need at a point in time, it is going to be very hard to move the customer along to loyalty. Run your lifetime value analytics at a modeled level - combine many interesting attributes, and learn where you are succeeding and where business isn't so good. If you are an analyst early in your career, you are probably already listening to my podcast (click here), right? A few months ago, I talked about what makes what I call a "Five Tool Analyst". The concept is similar to baseball, where the coveted five-tool prospect becomes a major league All-Star. The podcast has been interesting, in that I get feedback on two fronts. Analysts who think Execs are knuckleheads. Execs who think Analysts are knuckleheads. Only the Analyst can change this dynamic - by earning the requisite skills necessary to become a Five Tool Analyst. CREATIVITY: Here's what I've learned in the past twenty-eight years of analytical work ... creativity is sorely missing. When an Exec asks a question, an analyst provides a dry, non-living query that yields a boring answer that never anticipates the next question the Exec will answer. Consequently, the Exec keeps running the analyst in circles, and both parties end up hating each other. The best analysts come up with new techniques (i.e. stuff you cannot do in Google Analytics) that surprise and delight Execs. CREDIBILITY: In my consulting work, I'm frequently hired because an analyst failed in some way. If in-house analysts pleased Execs, nobody would hire me. And if I pleased everybody, I would have earned enough money to retire already. Since truth is somewhere in-between, it is really important to earn credibility. You won't please everybody all the time, but if your answers are unbiased and always accurate and tend to anticipate the next question, you will undoubtedly earn credibility. When people think you are credible, you get invited into situations that you have no right being in. When you are in those situations, many people get to see your work, and your career advances. CURIOSITY: The best analysts perform work nobody asked for, because they identify problems before Execs see the problems coming. This gets the analyst in trouble ... I was nearly fired once because I spent too much time focusing on an issue that the CEO believed to not be an issue at all, and then felt that I was 100% wrong and he was 100% right. Regardless, you will identify issues and you will play a key role in pushing your company in the right direction if you have sufficient curiosity. COMMUNICATION: The best thing that ever happened in my career was being forced to attend Dale Carnegie sales training. In just eight weeks, sixteen hours, I learned how to sell a message. Nobody teaches analysts how to SELL. It turns out that Execs buy what analysts sell. Work hard on your sales skills. CHOPS: I once worked with an analyst who ran a Monte Carlo simulation. The analyst then claimed that he had the answers to a problem because he could simulate different outcomes. The analyst knew a methodology - but the analyst didn't realize that the results were simulated results and were not actual findings. Naturally, the analyst crashed and burned when the findings where shared with analysts who possessed "chops". It is really important to know how to code, preferably in multiple languages. It is really important that the analyst know, at minimum, Generalized Linear Models, Ordinary Least Squares Regression, and Logistic Regression. The combination of coding and models / regression enables the analyst to do just about anything. The combination of Google Analytics and Excel allows the analyst to do what Google / Microsoft wants the analyst to do. Ok, you've made it this far. How many of the tools do you possess, if you are an analyst? And if you are an Exec, how many of the tools do you perceive your analyst possesses? Think about this for a moment. The most "digital" company of all time ... a company that has repeatedly told you to measure ROI and be data driven ... going so far as to provide you free software to prove that digital activities "work" ... and in the process biasing/blinding you into a "digital first" thought process ... that company runs happy, airy branding commercials on network television, a platform the digital elite tell you is "dead". 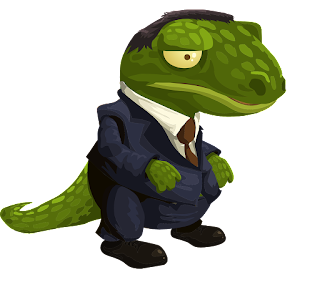 You are repeatedly being lied to by lemonheads who use Lizard Logic to promote a biased agenda. Put a Brand Response Marketing team in place. Harvest new customers this fall.